High standards have to be met by the pharmaceutical industry when it comes to drug quality and safety. These standards are documented in pharmacopoeias as officially recognized pharmaceutical rules, and published as legal tools of customer protection by authorities such as governments and medical societies. The identification of a drug depends on sensitive, reliable instruments and methods – as does the determination of the drug’s compliance with applicable regulations. 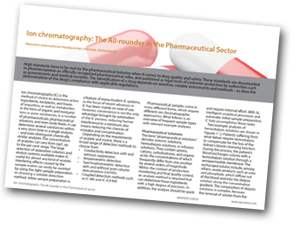 Separation Science, in collaboration with Metrohm, offers an article discussing the crucial role of ion chromatography (IC) in the pharmaceutical industry. IC is the method of choice to determine active ingredients, excipients, and traces of impurities, as well as metabolites in the form of organic and inorganic ions or polar substances, in a number of pharmaceuticals, pharmaceutical solutions, and even body fluids. It can determine several substances within a very short time in a single analysis – and even distinguish chemically similar analytes. The concentration of analytes can vary from ng/L up to the per cent range. The large selection of separation columns and elution systems available makes IC useful for almost any kind of analyte. Interfering effects caused by the sample matrix can easily be avoided by using the right sample preparation or choosing a suitable detection method. Inline sample preparation is a feature of many modern IC systems, as the focus of recent advances in IC has been mainly on ease of use. However, convenience is not the only advantage brought by automation of the IC process: reducing human interference to a minimum also means reducing the chances of mistakes and contamination. Pharmaceutical samples come in many different forms, which require different ion chromatographic approaches. What follows is an overview of frequent sample types with relevant example analyses.